At the beginning of March the Alaska Volcano Observatory raised the alert level at Okmok to Volcanic Alert level Advisory and Aviation Colour Code Yellow following an increase in seismic activity, including bursts of volcanic tremor. Since then activity levels have fallen and remained low, and yesterday came news that the AVO has lowered alert levels once again to the non-eruptive state of Volcanic Alert Level Normal and Aviation Colour Alert Green. 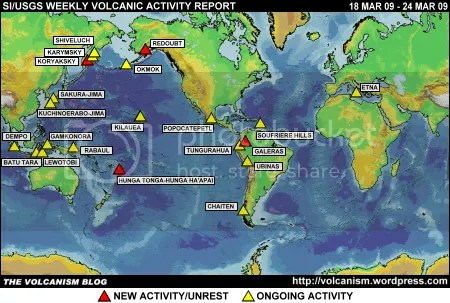 Posted by admin in activity reports, Alaska, Caribbean, Chaitén, Chile, Colima, Colombia, Ecuador, eruptions, Galeras, Guatemala, Hawaii, Japan, Kamchatka, Karymsky, Kilauea, Koryaksky, Mexico, Okmok, Redoubt, Russia, Sakura-jima, Santa María, Shiveluch, Soufrière Hills, Suwanose-jima, Tungurahua, United States, Weekly Volcanic Activity Reports. The Smithsonian Institution/United States Geological Survey Weekly Volcanic Activity Report covering 25 February 2009 to 3 March 2009 is now available on the Global Volcanism Program website. The following is a summary and not a substitute for the full report. New activity: Chaitén (Chile), Koryaksky (Kamchatka, Russia), Okmok (Alaska, USA), Sakura-jima (Japan). Ongoing activity: Colima (Mexico), Galeras (Colombia), Karymsky (Kamchatka, Russia), Kilauea (Hawaii, USA), Redoubt (Alaska, USA), Santa María (Guatemala), Shiveluch (Kamchatka, Russia), Soufrière Hills ( Montserrat), Suwanose-jima (Japan), Tungurahua (Ecuador). Posted by admin in Alaska, blogs, Cleveland, eruptions, Kasatochi, Okmok, United States. Three volcanoes are currently active in the Aleutian Islands: Okmok, Cleveland and Kasatochi. Chris Rowan at Highly Allocthonous ponders on this near-simultaneous eruption of three volcanoes in the same neighbourhood in an interesting post and asks. ‘Could the eruption of one have triggered the others?’ Answer: ‘no’. Disappointing news for volcanic chain-reaction catastrophists everywhere. Posted by admin in activity reports, Alaska, eruptions, Okmok, United States. No dramatic developments at Okmok, but the eruption continues. The latest weekly report from the Alaska Volcano Observatory comments that over the last week an ash and steam plume reaching altitudes of between 3000 and 10600 metres (10000-35000 feet) have been continuously erupted and light ash fall has taken place on Umnak and Unimak islands. From 28 to 30 July Okmok went to aviation colour code red because of a particularly vigorous eruptive episode: it is currently at colour code orange. Seismic activity is elevated but steady. During this eruption there have been periods of continuous and pulsating tremor strong enough to register on the seismic networks of neighbouring Alaskan volcanoes. Posted by admin in Alaska, eruptions, natural hazards, Okmok, United States. The NASA Earth Observatory has published an image of Alaska’s Okmok volcano in eruption, taken by the Moderate Resolution Imaging Spectroradiometer (MODIS) on NASA’s Aqua satellite yesterday, 23 July 2008. There was a great deal of cloud around, but the volcano’s plume, blowing eastwards and trending more to the south as it extends further from its source, shows clearly. The close-up below is taken from the large high-resolution version of the image. The dense white clouds over the caldera are water vapour, while the ash-laden plume, grey-brown in colour, streams away eastwards. Clicking on the images above will take you to the original source page. Credit: NASA image created by Jesse Allen, using data provided courtesy of the MODIS Rapid Response team. There are a lot of volcanoes on the Aleutian Islands and they have some great names: Shishaldin, Bogoslof, Chagulak, Adagdak. And there’s Okmok, currently in eruption, situated on Umnak Island in the middle of the Aleutian chain, a large basaltic shield volcano topped by two nested calderas. Being a shield volcano it’s a low, wide thing (35km wide, summit just over 1km) very different in form to most Aleutian volcanoes which tend to resemble the symmetrical crater-topped cones that children come up with when asked to draw a volcano. Recent eruptions at Okmok have come from a cinder cone within the south-western portion of the caldera, ‘Cone A’, marked on the map below. Above: Map of Umnak Island, showing Okmok volcano. Credit: Jessica Larsen, Alaska Volcano Observatory / Alaska Division of Geological & Geophysical Surveys. Click the image to go to the original source. Okmok is an active volcano, with an eruptive history that includes a VEI=6 (‘colossal’) eruption around 100BC and fairly frequent events of between VEI=1 and VEI=3 over the past two centuries. Its most recent eruption before this month was in 1997. Despite Okmok’s recent history of eruptions every few years, the current outburst came as a complete surprise because of the lack of precursory signs. Volcanoes usually give warnings of what they are up to, above all through seismic signals, but in this case the upsurge in seismicity preceding the eruption was only about 90 minutes in duration (the SI/USGS Volcanic Activity Report says ‘about an hour’). The eruption began on 12 July 2008 at 1143 local time and threw up an ash cloud to 15 kilometres (50,000 feet), posing a considerable hazard to North Pacific air transport routes. The relatively few inhabitants of Umnak Island were rapidly evacuated by fishing boat. The eruption slowly declined from its initial stages but remained vigorous and continuous for some days. Above: Aerial view of Okmok from the north, 20 July 2008 (Credit: Phil Walgren and Alaska Airlines). Click on the image to go to the original source. Volcano and aviation alert levels were lowered on 16 July, and on 17 July the plume had diminished to (still significant) altitudes of 7.5 to 9 kilometres (25,000-30,000 feet). On the following day the Alaska Volcano Observatory described the eruption as ‘episodic, with occasional, ash-producing explosions occurring every 15 to 30 minutes. The plumes from these explosions appear to be limited to about 20,000 feet above sea level’. Since then the eruption continues but has become less explosive – but the AVO warns that ‘Stronger explosive activity could resume at any time with little or no warning’. Interesting points about the current eruption are its unusually explosive character (for Okmok) and its location at Cone D [this should be ‘near Cone D’ – see comments below], in the eastern part of the caldera, rather than Cone A, which has been the seat of all recent eruptions. As if to keep Okmok company, Cleveland volcano on Chuginadak Island (about 140 kilometres from Umnak) erupted on 21 July, sending up a 4500-5200 metre (15000-17000 feet) plume. This produced the enjoyable headline ‘Cleveland volcano joins Okmok in Aleutian ash fest’ in the Anchorage Daily News.